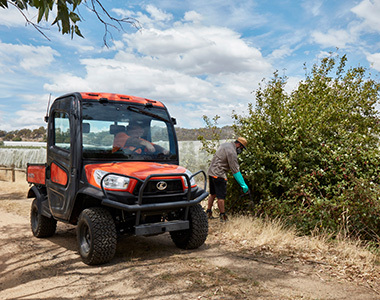 The Kubota RTV’s boast powerful liquid-cooled diesel engines for long and strenuous tasks. The 3 cylinder engines are quiet, powerful and bulletproof. The high-rigidity steel frame isolates the occupants from noise and vibrations. With structural strength that few in the industry can match, this durable frame can take years of punishment from heavy loads and rough terrain. 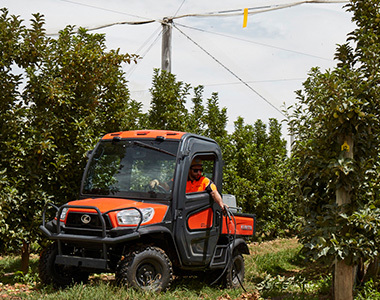 Maintain better control and shift less often due to the new transmission gearing with just two forward speeds (high and low), neutral and reverse. Under the hood you’ll find the radiator and air-intake located high and up front, where the air is cleaner and cooler. This improves both radiator performance and simplifies maintenance. 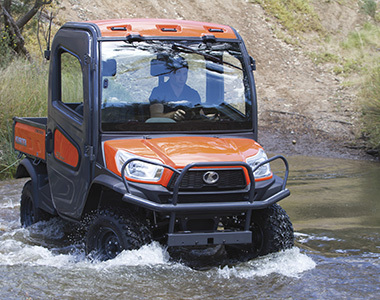 Kubota’s wide fin pitch design minimizes clogging, further improving radiator performance. Whether you’ve got a heavy load or no load at all, adjustment of the front and rear suspension height will ensure the proper vehicle height for a smooth ride and optimum drive-ability. The new X-series raises the bar on ground clearance to a full 263 mm with 205 mm of suspension travel, letting you glide over bumps rather than through them. You’ll feel more secure, especially when traveling down long inclines, knowing that dynamic braking is providing additional braking power and greater drive control. The factory fitted cabin features powerful air conditioning and heating, wind down windows, an ergonomic layout and boasts an exceptionally quiet ride. The digital meter cluster features bright, large and easy-to-read indicators, keeping you informed of all critical driving conditions, including speed, hours and kilometres traveled. An Overheat Alarm (light and audio) helps prevent engine damage. The parking brake is conveniently located on the dashboard for easier access as well as more leg-room. A large glove box on the passenger side provides fast access to critical tools and personal effects. Large compartments under the split-bench seats provide plenty of convenient storage space for tools, tie-downs and personal items. The heavy-duty steel cargo box can haul anything you need here, there and back again. Carry up to a half-tonne (500 kg) of tools, firewood, gear or supplies. Whatever you want to carry, cargo tie-down hooks come standard to keep your gear secure. 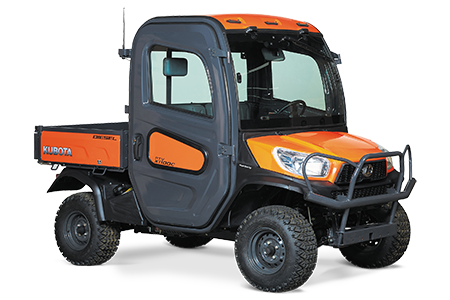 With the flick of a single lever, the hydraulic-lift cargo box rises and your cargo slides out. Cargo that could take significant physical strength and time to unload can now be dumped with little effort in just a few seconds. 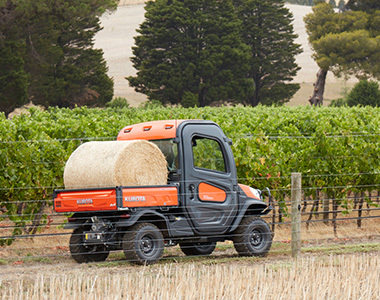 Standard two-inch hitch receivers at the front and back let you tow up to 590 kg of gear.